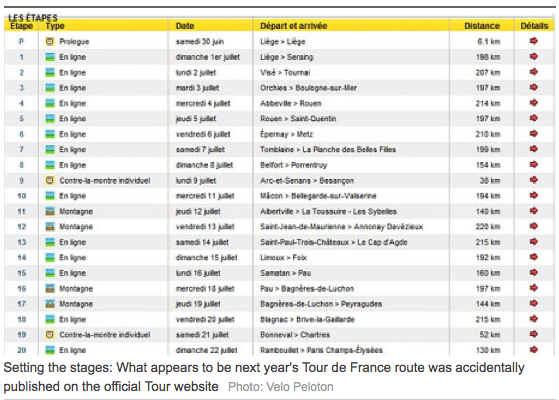 The route was supposed to be formally announced October 18th in Paris, but for a few minutes, in preparing the website, race owner Amaury Sports Organization (ASO) mistakenly published the 2012 Tour de France route on its official Tour de France website, letour.fr. It is a testament to how many people visit the official website, how many people are interested in the route, and how quickly anything online becomes history. Those few minutes mattered. The link was made live by accident and snatched. Most of the route had already accurately been guessed at the rumour sites Velo Peloton and Velowire anyway, but a few of the stages in the north and Stage 15-18 are a surprise. The direction of the last days of the Grand Boucle in the Pyrenees are a bit different from the guesses at the rumor mill. I am surprised at the lack of really big mountain top finishes except La Toussuire and Peyragudes (and they are not that big). The route is heavy in northern France this year, and briefly passes through the Alps and the Pyrenees. A Prologue plus two ITTs explain why it has been reported lately that Andy Schleck is working on his time trial skills. The 2012 route does not appear to be designed for the typical climber to carry the maillot jaune day after day. Although there will be some good cols (passes) included, a number of lower altitude climbs, and some nice small to mid-sized towns as start or finish villages. It is also an interesting twist to turn the route back on itself in the Pyrenees. 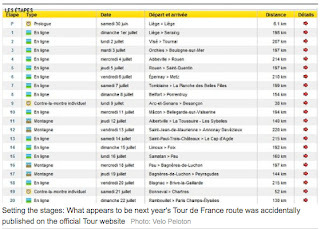 The crowds of fans near Belgium and Luxembourg during the first week of the 2012 Tour should be large and boisterous. In 2012 the final Individual Time Trial will be very close to Paris, making it an excellent final weekend package to attend in combination with the finish into Paris. These final stages of the TDF should attract huge crowds as they are just prior to the Olympics in London. Overall if you plan to chase the Tour in 2012, plan on doing a lot of driving and changing of hotels in week two and three. To me this route indicates a perfect year for millions of fans to see a single stage of the tour. I also think this route might affect the type of riders we see selected for the ProTeam rosters for the 2012 TDF, and definitely the overall winner. 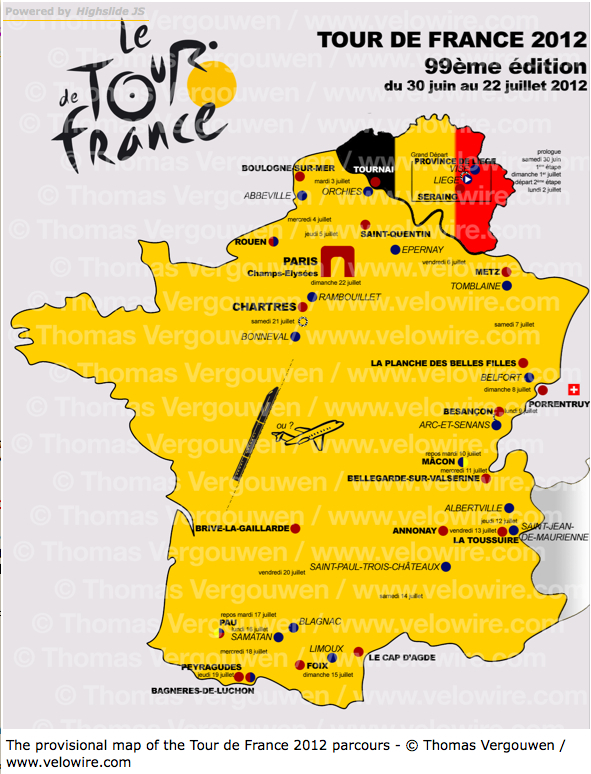 There will be 20 stages of the Tour de France this year, 30 June - 22 July, 2012, covering a total 3,479km. Time to pull out the maps and start planning your trip to the 2012 Tour de France! 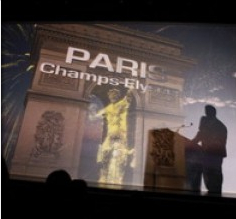 There is great pomp and circumstance that goes into the route announcement of the Tour de France each year, star riders and celebrities attend, history is celebrated in a grand ceremony. That tradition was to take place eight days from now in Paris. This is certainly a unexpected surprise today. The French love tradition and celebration. I hope they continue with the presentation even with the diminished suspense. 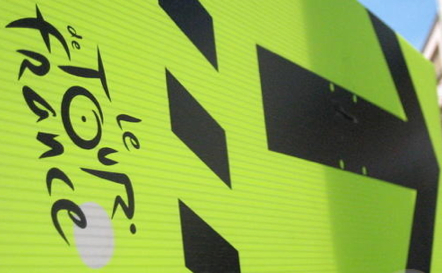 The Tour de France is still the biggest sporting event in the world. As my brother commented, "An IT guy just lost his job." Velopeloton made headline news today, and Paddy Sweeney is now on the history books as the first person to crack the code and truly discover the highly secretive route of the Tour de France before it's official release date.